Jessica Bridal offers exceptional service and full attention from our experienced consultants. A full Bridal Gown Consultation, will cost a Standard fee of $50. The consultation will last one hour on Saturdays and up to 1.5 hours on a weekday. In order to guide you through the collection and ensure availability of our consultants and fitting rooms you will need to make an appointment. You can BOOK ONLINE or CONTACT US as soon as possible. If you are interested in an exclusive, intimate atelier consultation please CLICK HERE. We understand that you may be nervous about your consultation, especially if it’s your first consultation. Please take the time to read below and our faq – and get in touch if you have any further questions. What will the consultation look like? At a full Bridal gown consultation, there will be a trained consultant and an open fitting room available at the time of your booking. The consultant will be working with you through the whole process, helping to select (approx. 6 gowns), bringing similar designs to view, pinning and advising design changes, etc. They will answer all your questions, give you a written quotation of your favourites, and any other details of dresses you may wish to retry. The retry session of up to two of your favourite dresses are included in the consultation fee. The consultation fee also covers the wear and tear on the wedding gowns. What are the payment details of the consultation fee? To secure your appointment: Please call us 48 hrs before your appointment for telephonic credit card payment to secure your booking. Or we can take a credit card number (Visa/Mastercard) at the time your appointment is booked and no charge will be made until 48 hours prior to the time. However we require a minimum of 48 hours’ notice to cancel or change the appointment, or a $50 charge is debited to the card. You may also choose to purchase a consultation online. Please ensure you have made the appointment first. Our cancellation policy fees apply to all appointments including 1st, 2nd, 3rd etc. Select 3 to 4 dresses from our website and bring the names with you. You can also bring 3 to 4 pictures of dresses you have seen on social media, websites, magazines, or that you’ve tried on elsewhere. Bring an open mind to the consultation and be ready for the unexpected as well – don’t be surprised if you find “the dress” on your first visit to Jessica Bridal. You are also welcome to bring your own heels (any colour will do), and great underwear (in a light colour) of your choice makes fittings easier. Who/how many should I bring to my appointment? Please indicate in your appointment the size of your group. On Saturdays, our store cannot accommodate more than 3-4 guests per group. If your group has more than 4 guests, you should schedule a weekday appointment or after 3.00 pm on Saturdays. We love babies, but we would like to politely request for separate arrangements to be made for them if you are making a Saturdays appointment. We strongly discourage toddlers, babies and strollers during the consultations as this can be a major distraction. In a case where arrangements cannot me made, we would strongly encourage you to make weekday appointment. Most of our samples are the traditional sample size, which is 10 – 14. We also have a smaller selection of plus size gowns of 20+. It is possible to do re-sizing in the fitting room with extensions and pins to allow you to view the design. The consultant will take your measurements and establish which standard size you need (according to the supplier measurement chart). Depending on the design, dresses can be ordered in size. 2 – 32. We regret to inform you that we have had difficulties when we have allowed photos to be taken. However, once you have made a purchase of a dress, you may take as many pictures as you’d like. Special-order, designer veils and headpieces have a 3-4 months lead-time. We encourage making a decision at the time you order your gown. A Standard veil can also be ordered from stock at a later fitting. Absolutely! Not only do many brides find their dress on their first visit to Jessica Bridal, but they also find all their accessories (veils, headpieces, jewellery and other bridal accessories) on this visit. You may walk in at any time to try on accessories on weekdays and if there is an assistant available they will be able to help you. There is a chance that you may need to wait. However, appointments are required to try on all veils and headpieces any day of the week. Which designers can I find at Jessica Bridal? 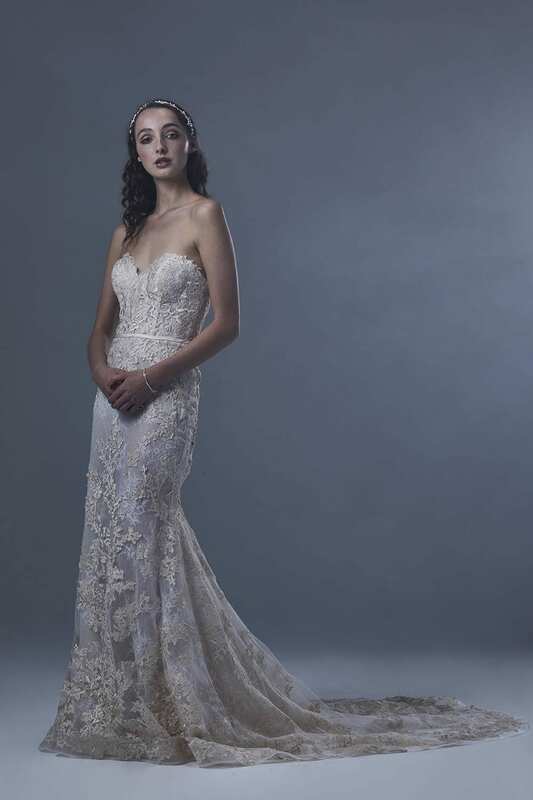 Zavana Bridal imported from Australia. Jessica Coutures our most loved, proudly New Zealand label.